I tend to like Targus products, which are typically well-designed, solidly constructed, and often innovative. Targus' "for Mac" line of computer accessories is pitched as "designed and built for a Mac, and nothing else." Most of these products could work fine with PC machines as well, but the Mac-centric focus is appreciated. When I first reviewed Targus' Chill Mat nearly five years ago, it was a utilitarian-looking device that did its job efficiently enough, but it wouldn't win any beauty contests or industrial design awards. The original Chill Mat was a rectangular slab of hard ABS plastic with a matte metallic finish and two embedded large-diameter, slow-turning cooling fans that drew heated air away from the laptop mounted on it, exhausting them through a wide, rear-facing port. 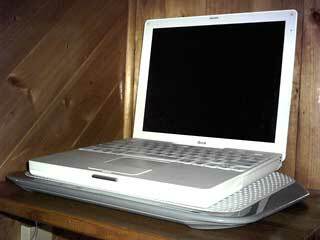 However, it did work well cooling down my 17" PowerBook on hot days under heavy processor load, and was quiet as well, which was much in its favor. 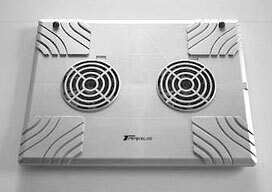 Consequently, when I learned that Targus had completely restyled and reengineered the Chill Mat as part of its "for Mac" fleet, I was interested to check out what had been changed. Well, the Chill Mat is still rectangular (albeit now with rounded corners) and still incorporates two USB-powered internal fans, but pretty much everything else is clean-slate different. Instead of hard plastic top and bottom surfaces, the new Targus Chill Mat for Mac is faced top and bottom with soft, breathable nylon mesh that will be comfortably gentle to your laptop's bottom and to your own lap or other support surface upon which it rests, protecting them from scratching and chafing as well as insulating from and reducing heat. Happily the Chill Mat still does an efficient job of cooling your laptop, keeping your thighs effectively insulated from heat, and providing a stable work platform. As part of Targus' "for Mac" series of laptop computer accessories, the Chill Mat now wears the "for Mac" signature glossy "Lunar Grey" livery instead of the older Chill Mat's drab and industrial-looking matte silver finish. 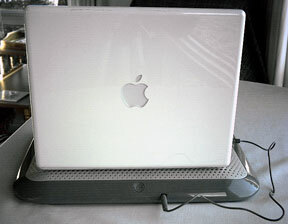 In terms of looks, it's no contest between the old and the new: The "for Mac" unit is a much more aesthetically attractive product, with its mirror-smooth plastic finish which, aside from a Targus logo, is clean except for a pushbutton on/off switch at the center of the back upper housing and the nylon mesh support surfaces. 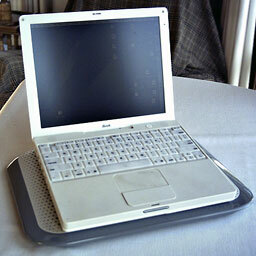 In terms of portability and quietness, however, the comparison is more equivocal. The second generation Chill Mat is significantly noisier than the original one, which was so whisper-quiet that the hard drives of some of my laptops effectively drowned it out. Not so with the new design. I wouldn't call its fans "loud" exactly, but you really do notice the sound they make when they're running. I'm not sure why this would be, since they look to be about the same size and shape has the ones in the old model. The old Chill Mat was flat and quite thin in section, orienting the computer parallel to the support surface, but the new model's upper body is slightly tilted so that the notebook rests angled higher at the back, a configuration many users prefer, although it's actually ergonomically incorrect. The tilted design makes the new Chill Mat substantially thicker than the old one, and therefore more cumbersome to store and carry. Measuring 15.16" x 11.22" x 1.45" and weighing 1.6 lb., the new Chill Mat is about 20% larger overall than the preceding model, reflecting an increase in widescreen notebook footprints these days, and it can comfortably accommodate all Apple laptop models including the 17" MacBook Pro and PowerBook. 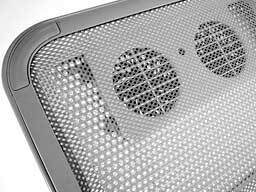 Another change - the "for Mac" model's two, single-speed internal cooling fans now push cooling air upward toward the bottom of the computer rather than drawing heated air away, as was the case with the older unit. 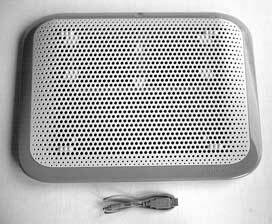 Power for the fans is supplied by one of the computer's USB ports via a supplied 28" USB cable that plugs into a port on the back of the Chill Mat. The fans don't draw a whole lot of power and are claimed to diminish a battery charge life by roughly 15 minutes - and that's no issue at all when plugged in to wall current. From a functional standpoint, the Targus Chill Mat for Mac fulfills its intended roles. The cooling fans can lower the operating temperature of the notebook in situ significantly, and when used in lap desk mode, it's much more comfortable than operating the laptop directly on your thighs - for enhanced comfort and stability as well as thermal benefits. It does what it's intended to do well and looks great doing it. The new "For Mac" styling is smart and tasteful, and the standard of finish is much higher than with the original product. 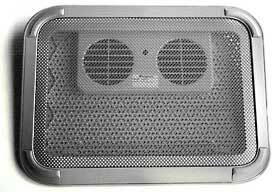 Aside from its greater bulk, which does make the new Chill Mat considerably less amenable to storage and carriage in a computer bag or backpack than the old one was, my main criticism is the noisier fans - but they're not nearly as loud as an internal laptop fan at high RPM. The Targus Chill Mat for Mac lists for $49.99 and is covered by a one year warranty.